When you think of a retirement community, what comes to mind? Do you see lonely shuffleboard courts, sleepy BINGO nights and disengaged residents? Not at Rolling Greens! They dare to blur the line between resort and retirement. From the amenities and events, to the people and places, this is a community you’re sure to love. 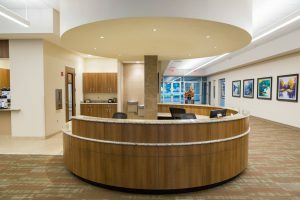 So, we wanted to present you with eight things you need to know about the new Community Center! and high-efficiency lighting outside are environmentally-friendly and cost effective. Florida is known as the sunshine state, and with that comes beautiful rays that heat things up. Low-E windows are more efficient than regular windows and help keep the heat out. The geothermal swimming pool heat pumps and AC system are energy efficient as well, and use the aquifer to heat and cool in an efficient and environmentally friendly manner. 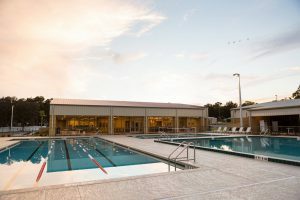 Enjoy Florida’s beautiful weather at Rolling Green’s Aquatic Center. 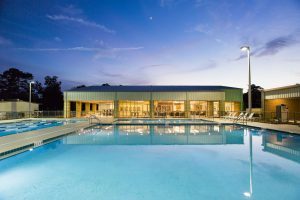 The heated therapy pool is perfect for water aerobics, volleyball and general activity. If you’re looking for more rigorous exercise, head to the lap pool, with three regulation lanes. Relax on our luxury pool furniture in this outdoor oasis as you spend time with friends or catch some rays. 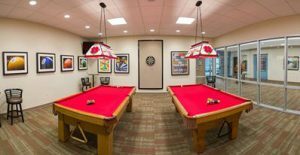 Live an active lifestyle with plenty of outdoor amenities like tennis, pickle ball, bocce, shuffleboard, and an 18 hole executive golf course. These amenities are surrounded by the community’s lush vegetation, so you’ll feel worlds away right in your own community. Take a breath and relax in the lush paradise of Rolling Greens. We offer plenty of great places for you to unwind. Sip warm complimentary coffee or tea as you enjoy the coffee lounge and comfy seating in the social area. Kick up your feet and find a good book in the cozy library. Close your eyes and start anew in our steaming saunas. Soak up the delightful Florida sun poolside or let the spa soak your cares away. Whatever you choose, relaxation is waiting for you. Get ready to break a sweat in our new fitness center. The state-of-the-art Cybex International equipment is low-impact and perfect for all ages and skill levels. Watch TV on the large LED screens or listen to your favorite playlist while you work out and afterwards hit the men’s and women’s saunas to unwind. 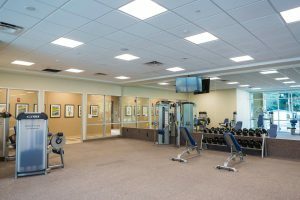 You’ll love this spacious and spectacular fitness center, located right in your own community. The Social Coordinator Kiosk combines cutting-edge technology with the fun culture of Rolling Greens to create a unique information center. The Kiosk will feature homes for sale, events in the community and much more! Each month, our full-time social director keeps our calendar buzzing with fun and exciting events. Meet new friends and have a blast when you attend holiday parties, bingo, game nights, movie nights and much more. There’s always something going on for you to enjoy. 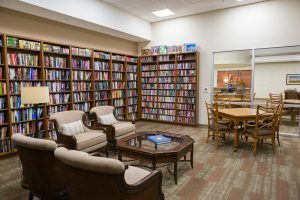 The Community Center features a Fitness center, Locker Rooms, Saunas, Library, Coffee Lounge, Billiards room, Kitchenette, Social Kiosk, Card Room, and a Multi-purpose Room. Whether you want to play, party, or peruse there’s something for you! It’s open each day from 8 AM- 10 PM, so you’ll have plenty of time to do the things you love. Plus there’s free WiFi, so you can kick back and make yourself at home. What’s better than an afternoon pick-me-up? A FREE afternoon pick-me-up. Stop by the Community Center’s coffee lounge for some free coffee. There’s so much to do, you might as well stay awhile.